Dr. Mmeje is an Obstetrician/Gynecologist with clinical and research training in Reproductive Infectious Diseases with particular emphasis in the treatment and prevention of HIV and other sexually transmitted infections within a global health context. This training has afforded Dr. Mmeje with the opportunity to work in an interdisciplinary capacity with researchers in Ethiopia, Kenya, and the United States. She is also working as a consultant with the Centers for Disease Control and Prevention on reproductive health initiatives. The research environment in Kenya has offered Dr. Mmeje access to communities with the highest HIV prevalence in sub-Saharan Africa which allows for sustainable, high impact interventions. Her research program in collaboration with investigators at the University of California, San Francisco and the Kenya Medical Research Institute is focused on evaluating mixed methods approaches incorporating behavioral and biomedical interventions for the prevention of sexual and perinatal HIV transmission. Her research activities in Kenya have generated knowledge on the current social and behavioral factors that impact HIV transmission in HIV-serodiscordant couples in sub-Saharan Africa. In the coming years, her proposed research activities may lead to implementation of safer conception interventions that will in part depend on defining an effective education and training curriculum program for healthcare providers and HIV-affected couples. These interventions are intended to change the practice of risky sexual behaviors by providing alternatives to natural conception, decrease HIV-related morbidity and decrease the likelihood of HIV transmission in HIV-serodiscordant partnerships. 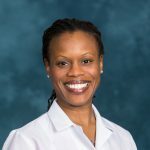 Dr. Mmeje has led the implementation and evaluation of expedited partner therapy (EPT) as treatment and prevention strategy for chlamydia and gonorrhea infection in Michigan. The intended findings of her evaluation will provide information on the preferred method of chlamydia and/or gonorrhea infection amongst patients and their sexual partner(s). It is her hope to share this information with insurance providers as a means to informing the covered benefits related to the treatment and prevention of sexually transmitted infections.